Chelsea Clinton had a £7,000, five-tier, gluten-free wedding cake at her 2010 wedding to Marc Mezvinsky – not because she’s coeliac herself, although she follows a wheat-free diet, but so that all her guests could enjoy a slice of her celebration. You may have coeliac disease yourself or just know somebody who cannot eat gluten and want them to be able to enjoy your wedding day without worrying about what they eat. Planning a gluten free wedding is simpler than it sounds – it may even be simpler than planning a gluten-based one! There are many wonderful caterers out there, who can make a gluten free wedding very straightforward – but it’s important to be sure that they really know how to cook gluten free food. One bride I know went so far as to write out a list of foods, dishes and ingredients for her caterers-to-be and make them draw a line through every item that contained gluten. Of the forty-something foods she listed, they got just one wrong (beef braised in beer, because most beers contain gluten from the barley) and she felt confident to work with them. Other people prefer to give their caterer a set of recipes to work to, but this can sometimes be impacted in strange ways, especially if the caterer is not totally committed to gluten-free cuisine. At one wedding supper, the carefully selected chocolate fountain had to be abandoned because one of the catering team had decided that the fruit laid out to dip in the gluten-free chocolate sauce looked a bit ‘boring’ and so dusted the trays with powdered chocolate – which contained gluten! Whatever you decide to do when working with a caterer, it’s vital to remember that you need to agree a balance on who makes decisions about foods and ingredients. Unlike a ‘traditional’ wedding, where the caterer will usually substitute or transform dishes depending on what is available in the run up to the wedding, a gluten-free reception may require more careful planning just to ensure that the food ‘looks’ right as well as tasting right and avoiding allergens. It’s becoming increasingly common for families to cater for their own wedding receptions, either asking people to cook and bring a dish according to a recipe they’ve supplied, or actually cooking ahead themselves. This fits well with the trend to celebrate weddings in unusual places or in a less formal manner. If you decide to opt for a formal wedding reception that you cater yourself, try to ensure that you choose dishes that can be prepared well in advance. A centrepiece is essential to a formal reception, and something like a whole poached salmon with various salads surrounding it, accompanied by a really good selection of gluten-free cheeses, can look spectacular without requiring too much effort on your part. For a simpler approach, consider something really different such as a hog or lamb roast, or a make your own sushi and sashimi reception where guests create their own food! 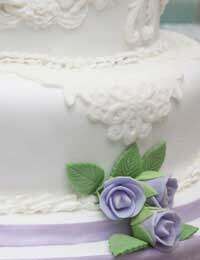 The wedding cake itself is usually provided by a specialist if it is traditionally shaped and gluten-free. This is because it can be quite difficult to ice and tier gluten-free cakes. Alternatives to the traditional wedding cake include one or two layer cakes made from polenta, which are particularly popular in summer when they are decorated with fresh flowers to give an informal appearance, or ‘frozen’ cakes, which are tiers of sorbet decorated with berries and which have to be served very quickly or they melt.